Recent flooding in the Chehalis basin has led managers, residents, and others to begin evaluating options for managing flood risk in the future. Climate change is expected to both increase the risk of flooding and result in decreased summer low flows – with implications for human communities and ecosystems alike. This page summarizes the results of a study aimed at quantifying the impacts of climate change on streamflow in the Chehalis River basin. This section provides a brief overview of the provenance of the streamflow projections. For additional information, please see the project report. A primary motivation for this study was the need to reconcile disparate estimates of climate change induced changes in flood risk. In order to provide multiple estimates for comparison, projections were made using two downscaling approaches – one statistical, and one dynamical – and two hydrologic models. Dynamically downscaled projections: Weather Research and Forecasting (WRF) Mesoscale Model (http://www.wrf-model.org; Skamarock et al. 2005). Projections are based on 2 global models included in the CMIP5 (Coupled Model Intercomparison Project Phase 3, Meehl et al. 2007) experiment. Projections span from 1970-2069 and are based on a moderate (SRES A1B) greenhouse gas scenario. Both downscaled climate datasets are produced at 0.0625-degree resolution (about 5 km x 7 km). The MACA projections use a bias-adjusted version of the Livneh et al. (2013) gridded observational dataset as a basis for the statistical downscaling. For comparison with the MACA results, two versions of the WRF projections are included: (1) “RawWRF”, in which the daily weather fields from the WRF model are simply bilinearly interpolated onto the 0.0625-degree grid, and (2) “bcWRF”, in which an additional bias-correction is applied to match the statistics of the Livneh et al. dataset. 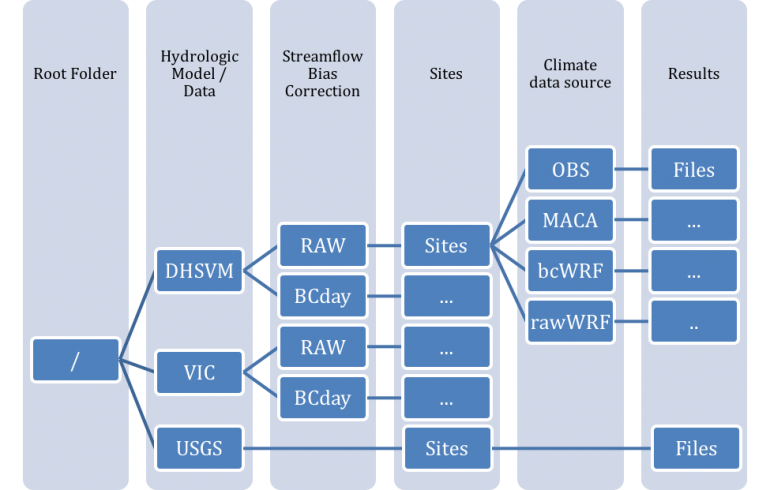 The Variable Infiltration Capacity (VIC) Macroscale Hydrologic Model (Gao et al. 2010). VIC is a physically based macro-scale hydrologic model which simulates all aspects of the hydrology affecting surface and shallow groundwater. We used VIC model version 4.1.2 implemented with inputs developed by Hamlet et al. (2013). The Distributed Hydrology and Soil Vegetation Model (DHSVM, Wigmosta et al. 1994). DHSVM is a gridded, spatially distributed hydrology model that represents physical characteristics of the watershed, using characteristics such as topography, land cover, soil type, soil thickness, and a streamflow network. For this study, we implemented DHSVM at 150 m resolution. The map below links to historical and future streamflow projections for 58 sites chosen in tandem with project partners. Out of all of the sites, 11 had sufficient USGS streamflow observations (at least 30 years) for bias correction. These were bias-corrected using a newly-developed approach, in which the statistics of the daily streamflow estimates are adjusted to match the observations. This is likely to result in improved estimates of extremes (flooding, low flows). For those interested in downloading the full archive, the figure below shows how the results are organized. Figure 1. Data structure for streamflow results. Funding for this project was provided by the Washington State Recreation and Conservation Office (RCO #15-1479) via a sub-contract with Anchor QEA, LLC. Abatzoglou, J. T., & Brown, T. J. (2012). A comparison of statistical downscaling methods suited for wildfire applications. International Journal of Climatology, 32(5), 772-780. Gao, H., Tang, Q., Shi, X., Zhu, C., Bohn, T. J., Su, F., Sheffield, J., Pan, M., Lettenmaier, D. P., and Wood, E. F. (2010). Water budget record from Variable Infiltration Capacity (VIC) model. Algorithm Theoretical Basis Document for Terrestrial Water Cycle Data Records. Hamlet, A.F., M.M. Elsner, G.S. Mauger, S-Y. Lee, I. Tohver, and R.A. Norheim. 2013. An overview of the Columbia Basin Climate Change Scenarios Project: Approach, methods, and summary of key results. Atmosphere-Ocean 51(4):392-415, doi: 10.1080/07055900.2013.819555. Livneh, B., Bohn, T. J., Pierce, D. W., Munoz-Arriola, F., Nijssen, B., Vose, R., … & Brekke, L. (2015). A spatially comprehensive, hydrometeorological data set for Mexico, the US, and Southern Canada 1950–2013. Scientific data, 2. Meehl, G. A., C. Covey, T. Delworth, M. Latif, B. McAvaney, J. F. B. Mitchell, R. J. Stouffer, and K. E. Taylor, 2007: The WCRP CMIP3 multi-model dataset: A new era in climate change research,Bulletin of the American Meteorological Society, 88, 1383-1394. Rupp, D. E., Abatzoglou, J. T., Hegewisch, K. C., & Mote, P. W. (2013). Evaluation of CMIP5 20th century climate simulations for the Pacific Northwest USA. Journal of Geophysical Research: Atmospheres, 118(19). Skamarock, W. C., Klemp, J. B., Dudhia, J., Gill, D. O., Barker, D. M., Wang, W., & Powers, J. G. (2005). A description of the advanced research WRF version 2 (No. NCAR/TN-468+ STR). National Center For Atmospheric Research Boulder Co Mesoscale and Microscale Meteorology Div. Wigmosta, M. S., Vail, L. W., & Lettenmaier, D. P. (1994). A distributed hydrology‐vegetation model for complex terrain. Water resources research,30(6), 1665-1679.